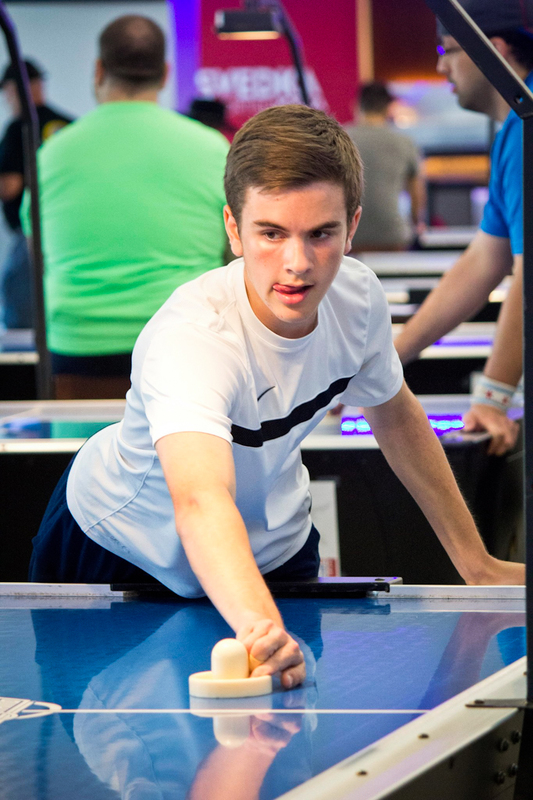 Air hockey keeps getting older and so does the median age of its player base. The second wave of young players—who connected with the sport during the 1990s—are now firmly in their 40s. Players in the Old Guard are in their 60s. Sometimes air hockey feels like that Stallone/De Niro boxing movie, Grudge Match, for better or worse. Where is the new blood? The last (and only) time a teenager became world champion was back in 1989. Colin Cummings recently changed all that by winning two world championships, back-to-back, as a 16-year-old. Although his rise seems meteoric, it was the direct result of six years of hard work—playing air hockey nearly every day and focusing on improving specific skills. 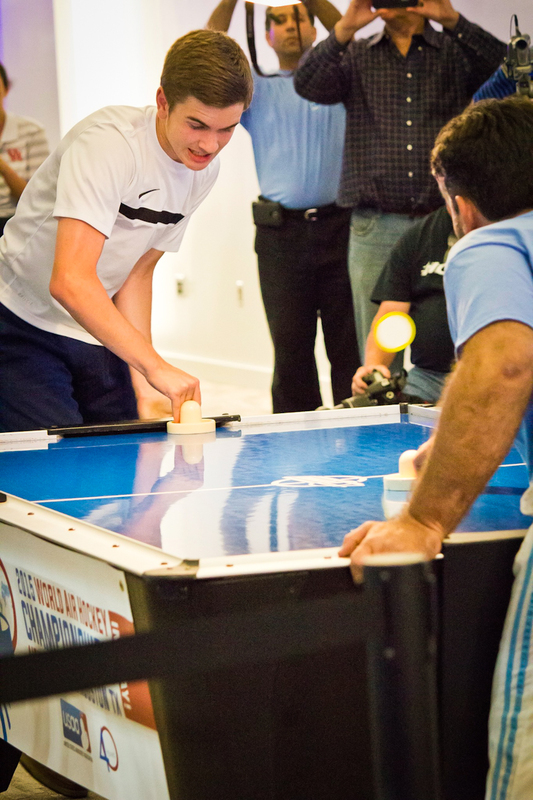 His air hockey adventure began as a ten-year-old when his family moved into a house in suburban Houston across from frequent top-ten finisher Brian Accrocco and his son Steven. Cummings first played on a professional-style table in the Accrocco’s garage, and it was there that he learned about the humiliation of losing, and losing often. WOTP: Why does air hockey appeal to you? The game came out of the 1970s and even the idea of a video arcade seems ancient now. Cummings: Strangely enough, to me air hockey isn’t an arcade game. I’ve played in people’s garages, or in people’s houses, or at the movie theater, or at SRO in Houston, which has four tables. I’ve never really imagined it as an ancient arcade-type game. I thought it was new and fresh and it was never in my mind that it was old or dying out. WOTP: At what point did you realize that this was something that you could be good at? Cummings: In 2012 I competed in my first U-14 tournament for kids at the World Championships and I ended up beating Steven [neighbor Steven Accrocco] in the finals. When I saw that I could beat a kid who had been practicing and playing air hockey his entire life, I knew that I had some kind of skills. And after watching the final of the main tournament between Billy [4-time world champion Billy Stubbs] and Ehab [defensive genius Ehab Shoukry] and just seeing how much competition was going on and how many people were watching the tournament and how some of these people literally put their whole lives into it—I knew it was something that I’d stick with for a long time. That was the first time I felt could really advance in this a lot further and maybe someday become world champion. 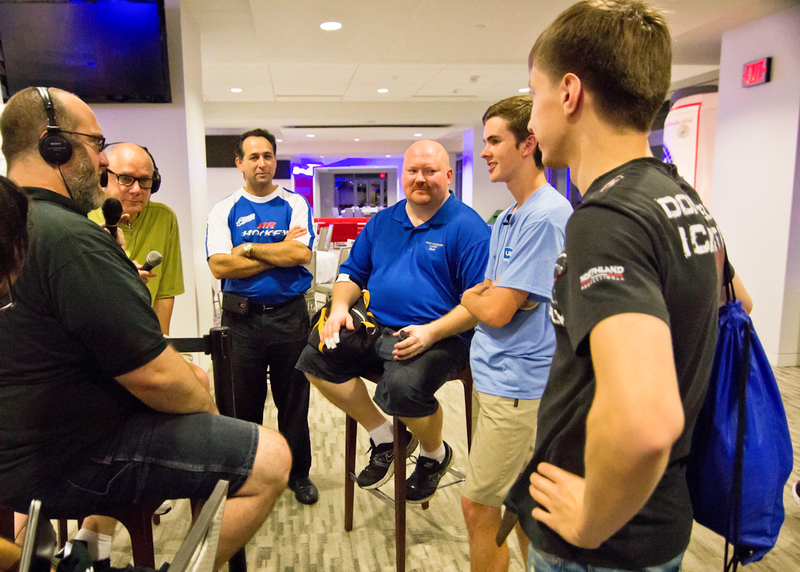 WOTP: Why do you think you were able to surpass your neighbor Steven Accrocco? You had far less experience. Cummings: I think I just wanted it a lot more than he did. When we first met he was the king and he’d already been playing air hockey for six years. At that point he probably thought he had reached the highest level. One day I started thinking about how I had all the same materials given to me—I had the same body size as Steven and we were both smart. I wondered why he could beat me and I couldn’t beat him. So before that day I’d go over to his house and maybe we’d play for an hour before hanging out or riding bikes or whatever we’d do, kid stuff. But after that day I realized that if I played every day more seriously eventually I’d start passing up people. And that’s just exactly what happened. WOTP: Let’s talk a little bit more specifically about your game. What is your playing philosophy? Cummings: I have about six different ways that I like to hold the mallet and each helps me with different shots. I have a lot of different ways to attack people. I definitely wouldn’t say that I practice shooting one shot 50 times and that I can hit it 49 out of 50—that’s not how I really work. I can shoot every shot and when I’m in the zone usually it’ll go in perfectly every time. I don’t have a lot of mess-ups in tournaments anymore. I like to have a whole bunch of different shots—I like to widen my artillery—to make sure that whatever kind of defense I’m put up against I have the perfect solution they might not be ready for. So one advantage is this huge variety of different tools that people aren’t ready for. Another is that I’m extremely fast and I run pretty much every day. And I come in with the attitude that I’m not going to stop—I’m not going to lay down—there’s no way that I’m going to slow down for anything. 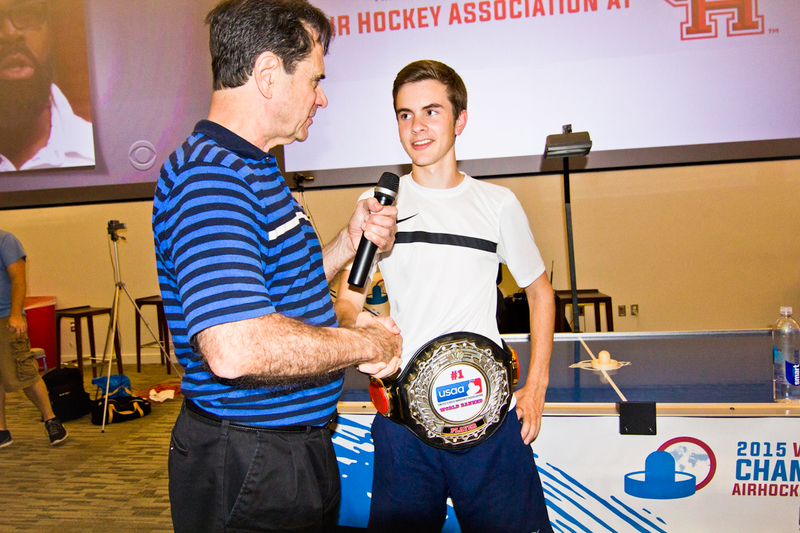 Colin traveled to Colorado in 2015 to compete in the AHPA World Championships. Although his best finish ever was sixth place, he beat his neighbor’s father Brian Accrocco in the winner’s bracket final en route to dethroning the current world champion, Billy Stubbs, in the championship. 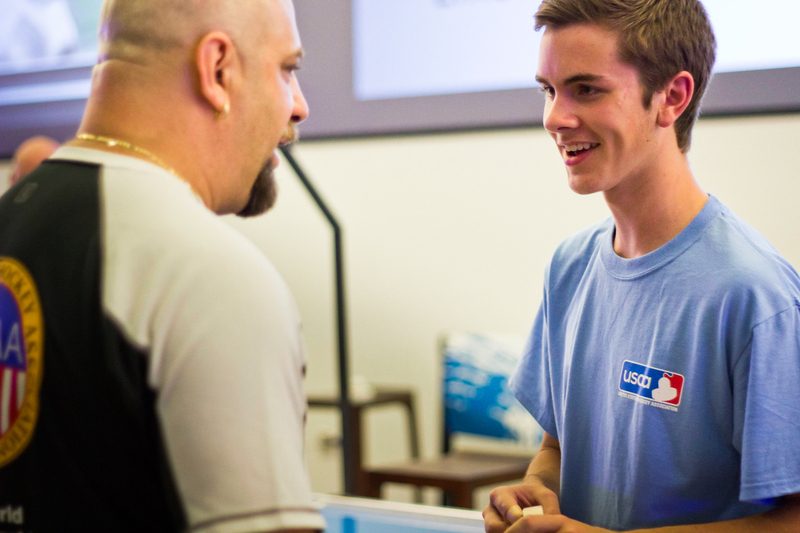 Colin became the youngest world champion ever, although some grumbled because this was the first tournament promoted by the divisive, upstart AHPA, and fewer players had attended. WOTP: Do people ever try to delegitimize your championships by saying you won against a weak field? There are people who always talk, right? Cummings: A lot of people did say that after Colorado but those words probably affected the people around me more than they affected me. I knew I had just taken down the champion and if people thought they were going to give me a harder time than him, well, that didn’t make much sense to me. I was happy that I won either way. Some people said, “The only reason Colin won is because there was a low turnout,” so I was expecting somebody to challenge me for my ranking. But nobody stepped up. Nobody said, “I’m going to take out this little sixteen-year-old kid.” Everybody just got quiet. WOTP: Can you talk about your next tournament? WOTP: What do you think about the Venezuelans and their style of play? 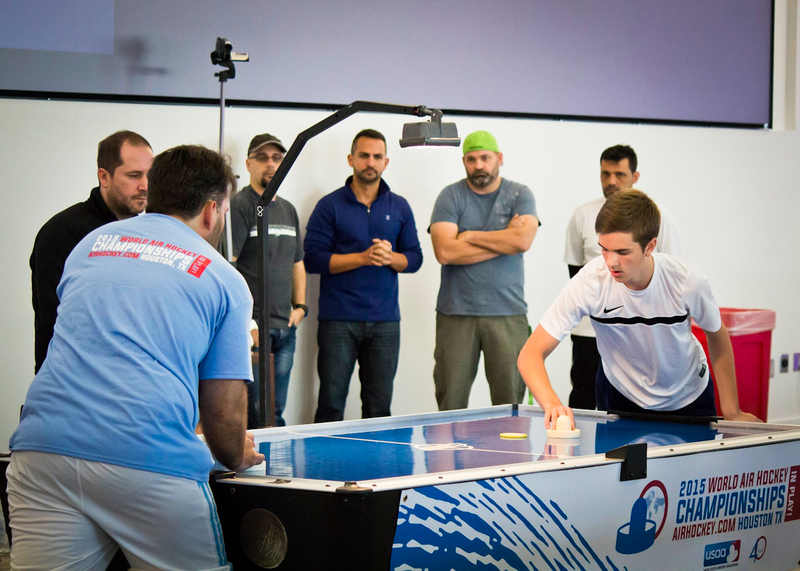 WOTP: Were you able to compete against many air hockey legends at this tournament? Cummings: I was able to play against almost everybody. I played Andy Yevish a lot especially since he was my double’s partner. I played Billy [Stubbs] one practice game and I think I played Ehab too in a double’s game and I definitely played Tim [10-time world champion Tim Weissman] and Jesse Douty [11-time world champion]. And even Jose Mora [3-time world champion]. I played all of them. I had a huge smile on my face the whole time. In singles I was able to play against Wil Upchurch [2-time world champion] again, who is this gigantic man with a great beard and scary glasses. I thought he was going to destroy me! And somehow I was able to beat 11-time world champion Danny Hynes, who has crushed me so many times before. He beat me the first two games but I didn’t give up. I said, “You know what? I don’t care. I’m going to play him even harder!” And I started shooting more off-goals and outspeeding him and using his best shot against him, which is the right-wall-under. And I kept myself in the match by stuffing his cuts, which didn’t make him happy! WOTP: Can you describe what it was like playing Pedro Otero in the finals? Cummings: Pedro ended up beating Danny [Hynes] to win the loser’s bracket. Danny and Pedro are really good friends and Danny was taking him down. He was actually up 3-0 and then somehow Pedro came back and won four games in a row. He was on fire—I thought he was this giant coming up to take me down! Afterwards, Pedro came up to me and said, “See? It’s me and you now. It’s going to be a great match!” And I just said, “Oh man!” Pedro and I played three years ago in Chicago and he beat the nuts out of me, 4-0. That definitely wasn’t my time. I wasn’t anywhere near the right level. I remember him pounding the hardest right-wall-unders that I’d ever seen. And you know it’s coming. You just know it’s going to be a right-wall-under right in your face and you can prepare for it all you want but he’s just going to shoot it anyways. And it’s just so fast that I wasn’t ready for it at the time. This time I knew it was coming so I knew I had to hold the mallet in a way so that I didn’t have any fear of how fast the puck was coming. I couldn’t be afraid of getting my fingers hurt and after a while I gained confidence. A couple of times when he shot his right-wall-under or right-wall-over I charged it and after charging it a couple of times I knew that he was a little bit iffy on whether he should shoot it or not. And whenever I saw him thinking about it that’s when I could tell what shot he was going to shoot. On offense I went with a lot of cuts and cross-straights. The Venezuelans don’t play as much of a set-up game as we Americans do so they are not as used to it. Plus I did it a lot faster. The hard-fought final went to seven games, with Cummings prevailing over Otero in the last game 7-5. 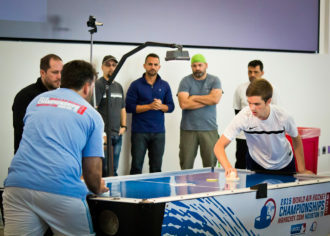 Although some players had dismissed his previous victory in Colorado, Colin silenced his critics by defeating a deep field in the best-attended tournament in air hockey history. WOTP: Now that you are world champion do you feel any pressure to retain your title? Cummings: Yes, but probably less pressure than past champions have. If people beat me then I have a lot of time to come back and beat them again. The first person that’s going to beat me could be anybody. Mostly it depends on how much I want to keep my skills going. All I think about is getting myself better, getting the people around me better and just having fun in air hockey right now, that’s all I can do. Because as soon as I lose the fun that’ll be the day that I lose a tournament. WOTP: So air hockey is still as fun as it was? Cummings: It’s a different kind of fun. Before it was fun to just hang out with my friends—people who were the same age as me—and talk about air hockey and other things. But as I got better people didn’t want to play me anymore because they knew I’d just wreck them without even trying! WOTP: Are younger people gravitating toward air hockey or are you a singularity here? How does the future look for the sport? Cummings: About 20 people in my school are really interested in air hockey full force and are going to try and play in the next world tournament with me. I think there’s a bright future ahead for air hockey but we’re going to have to put some work into it. I see a whole lot of things we can do in the future. I want to start setting up air hockey clubs more widely in different areas. I’m going to fly to the Air Force Academy in Colorado; I’m going to start a foundation here in Beaumont before I leave. 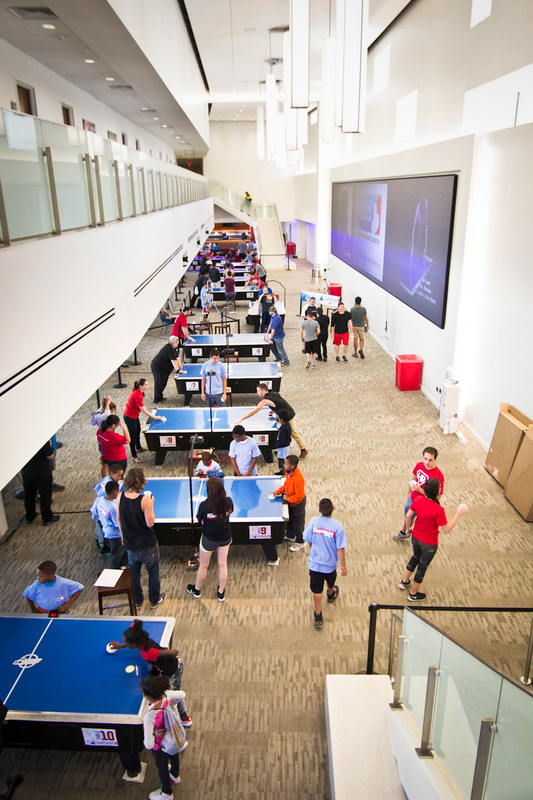 Once we just establish certain areas we’ll be able to get more and more air hockey clubs set up everywhere and we’ll have a lot more people that will be interested. Our goal should be to keep new players, not just show them air hockey one time and then let them go off. WOTP: Is there anything else you’d like to add? Cummings: Everybody really does like air hockey! If I bring it up in conversation, people will usually say, ”Man, I love air hockey; I want to go play that.” Sometimes the hard part is just getting a table somewhere, getting a nice location, getting players together. All photos taken by Jeorgia Rodriguez and used courtesy of the USAA.